Saint Laurent flat-top sunglasses in titanium. 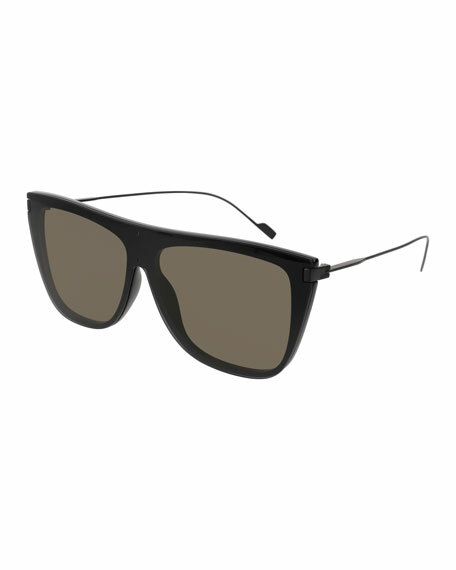 Fendi shield sunglasses in propionate. Eye/bridge/temple (in mm): 99-01-145. Shield lenses with FF-pattern overlay. Screw detail through front. Adjustable nose pads. Faceted, metal arms. Logo detail at temples. Capped earpieces. 100% UVA/UVB protection. Made in Italy. Oliver Peoples "Daddy B" 1970s-inspired sunglasses in acetate. Lens/bridge/temple (in mm): 58-19-145. Square, polarized lenses. Three pins at frame front. Ray-Ban aviator sunglasses in metal. Lens/bridge/temple (in mm): 58-14-140. Solid-color lenses. Double nose bridge; straight brow bar. Adjustable nose pads.